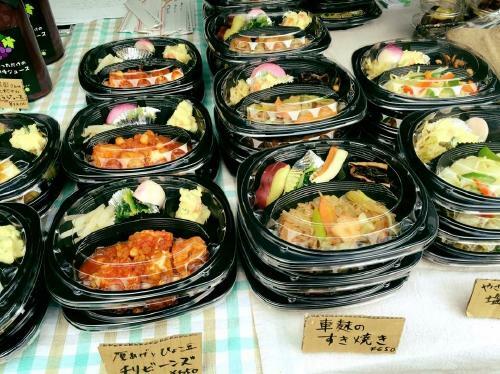 1 How about some delicious veggie eats in Kofu? 2 Everybody gather ‘round, “Yocchabare!” at Kofu Station on April 14th and 15th. 3 Kofu, a city of jewels: co-hosted by a stone collection event! 4 The best time of year to enjoy the peach and cherry blossoms at once! Let’s also tour the surrounding areas. 5 Interview with the promoters of the event and also the owners of Fluunt KOFU and No Café hakari. How about some delicious veggie eats in Kofu? Vegetarian food is oftentimes considered to be something special that is only eaten by a select number of people, but it is in fact very natural and enjoyable. It is peaceable and has numerous benefits. The best part is that it is really tasty. Green Veggie KOFU was organized to inspire such interests in the form of a marketplace. 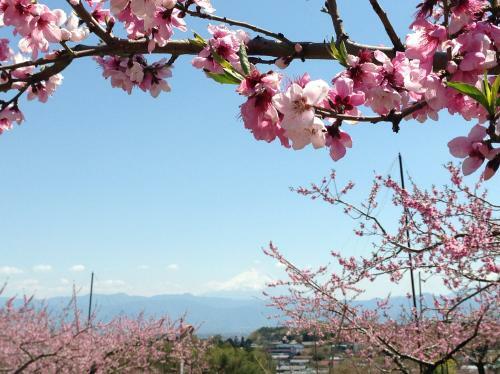 The event will be held on April 14th and 15th – just the perfect time to view the peach and cherry blossoms in full bloom in Yamanashi. The entire area will be blushing in a sea of pink flowers. 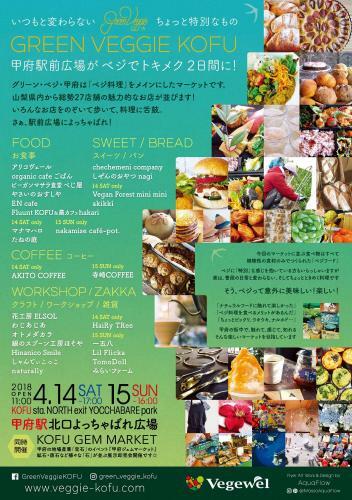 We wanted to show our support for this veggie event in Kofu where there are many promising vegan and veggie restaurants as well as a vast selection of organic vegetables and raw materials. Vegewel will be there to support as the executive committee to liven up the event! Everybody gather ‘round, “Yocchabare!” at Kofu Station on April 14th and 15th. 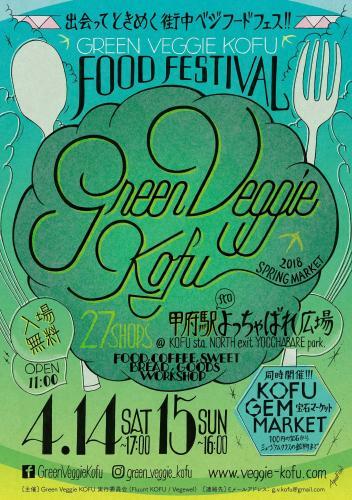 Green Veggie KOFU is a marketplace with a focus on veggie food. There will be many interesting shops like handicraft shops and workshops in addition to veggie and natural foods. The “Yocchabare Square” located at Kofu Station. ”Yocchabare” means “gather around” in the Koshu (area of Kofu) dialect. Kofu is just a little over an hour away on the Express Azusa train and around a 2-hour drive on the highway bus. 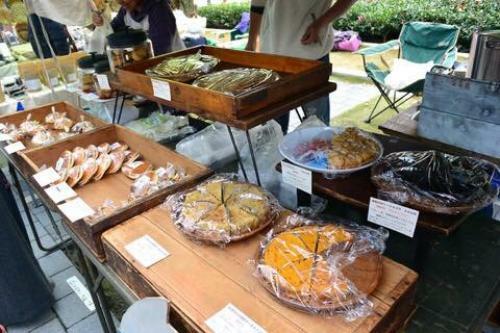 Those city dwellers without cars can still enjoy the vegan, vegetarian, and organic food fest of Yamanashi that is well worth the money! Of course, there are many places to park your cars in the area so drive on over! Kofu, a city of jewels: co-hosted by a stone collection event! Kofu City is the capital of Yamanashi Prefecture and served as the former base for the feudal lord, Takeda Shingen, but did you know that it is also a city of jewels? The northern side of the city flourished as a crystal mining site with Shosenkyo being one of the most famous sightseeing locations. Their polishing and processing craftsmanship was so well-accomplished that gem polishing and decorating developed into an industry. The upcoming Green Veggie KOFU will be co-hosted by KOFU GEM MARKET at which a wide array of minerals and gemstones – from 100-yen power stones to rare and expensive gems – will be presented. There will be many workshops, like gemstone kaleidoscope making, which you can enjoy without the need for reservations. The best time of year to enjoy the peach and cherry blossoms at once! Let’s also tour the surrounding areas. I make it a point to visit Yamanashi every year on the third week of April to view the cherry and peach trees in full bloom. The pink tinted panorama with the Yatsugatake and Minami-Alps mountains in the backdrop is magnificent. In addition, Kofu City boasts a famous sightseeing spot at Shosenkyo, considered to be the most beautiful gorge in Japan, as well as the Kanazakura Shrine which is known for its money growing tree, the Ukon Cherry Tree, that brings good fortune with money. There are also the Yamanashi Prefecture Museum and many other locations of interest. Shosenkyo is a gorge where crystals and jade were discovered. It is a place of beauty, attracting many visitors who seek to get a glimpse of the granite cliffs, which were constructed naturally over a long period of time, as well as the view of the waterways and falls that flow over the rocks. There are also onsen with pristine water quality and wineries located all around the area. With just an extra 30 minutes by train or car outside of Kofu, visitors can also tour the highly recommended Kobuchizawa and Kiyosato areas. 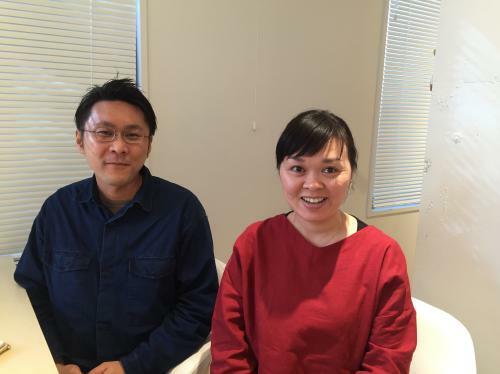 Interview with the promoters of the event and also the owners of Fluunt KOFU and No Café hakari. Mr. Hirano operates a veggie café, Fluunt KOFU, in Kofu City and Ms. Kazama runs a Nou Café hakari, which is situated adjacent to the Okita Noen (Okita Orchard) in Ichinomiya of Fubuki City, an area noted for its production of peaches. Fluunt serves veggie burgers, soy milk-banana-chocolate-whipped cream-sandwiches, and other healthy “junk foods”, and hakari offers hearty macrobiotic and well-balanced meals that attract a fan base from outside of the prefecture. 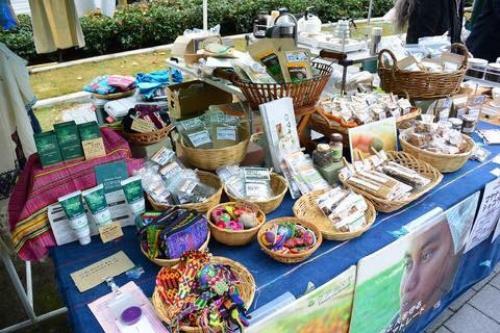 The young couple organized this event in an effort to raise awareness for vegan and vegetarian diets while livening up the entire city of Kofu, all through an inclusive effort through the support of the prominent figures of the community and the government. ”We believe that if we can let people know about how delicious and enjoyable veggie foods are, and if more and more people become aware, we’ll start to see some progress in solving many of the social issues we face today. We’d like for Green Veggie KOFU to be a chance to touch on the common, everyday veggie foods in a casual manner. They feel a strong passion for this event. Let’s venture out and enjoy some mouthwatering veggie dishes and mingle with the crowd. Come to the event office tent and let us know that you saw Vegewel, and you will receive a shopping coupon valid for use (including food and drinks) at the event! *Coupons are available to the first 25 people for each day.